The data set provides a 30-m comprehensive fuelbed characteristics map for both the wildland and cropland areas of the conterminous United States (CONUS) for 2010. 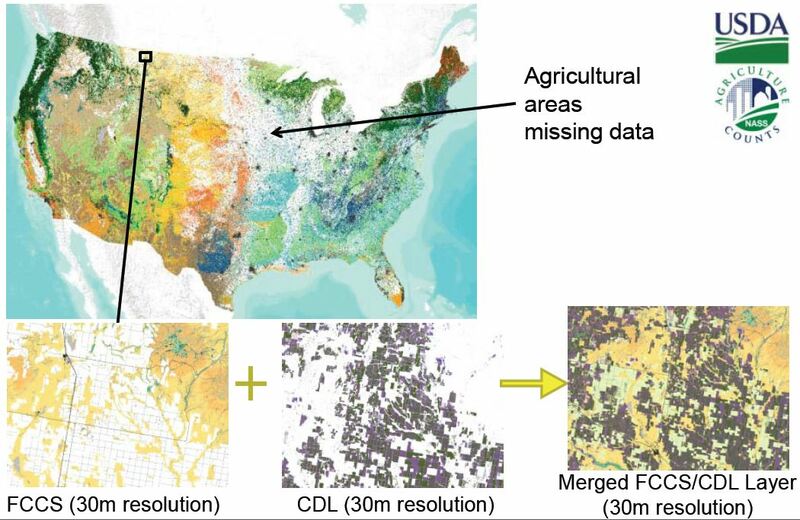 This integrated product is the result of combining the spatially discrete Fuel Characteristic Classification System (FCCS) data of the US Forest Service (USFS) with the crop-and grassland-specific information of the US Department of Agriculture’s (USDA's) Cropland Data Layer (CDL). There are three GeoTIFF format files and three comma-separated companion files distributed with this data set. The three tif files provided are very large and exceed the size limits of a standard GeoTIFF file format (4 GB). File sizes range from 20 to 30 GB. Compressed file sizes range from 2 to 3 GB. They are in a format that is called a BigTIFF file. ArcGIS 10.0 and ERDAS Imagine are able to read these files. The CDL product (cdl_conus_2010.tif) is a spatially continuous discrete raster file of the CDL for 2010 at a 30-m spatial resolution for the CONUS area. This file is a mosaicked data set of individual state CDL layers provided annually by the USDS National Agricultural Statistics Service and contains 126 cropland and other vegetative classes. The Vegetative Code classes for the CDL layer are distributed in the companion file CDL-FCCS_Crosswalk.csv. The FCCS product is a discrete raster layer at a 30-m spatial resolution for 2010 that provides fuelbed component information used in the FCCS developed by the USFS from US Geological Survey (USGS) Landfire project base data (see description at the USFS FCCS web site (www.landfire.gov). This layer is unique to this data set because it is at 30-m resolution and the one provided by the Forest Service to the public is at 1-km resolution. Fuelbed Codes are provided in the comma-separated companion file- FuelbedCodes.csv. The merged product, cdl_fccs_merge_2010.tif, is a raster file that is a combination of the CDL_2010 raster file and the FCCS raster file. This file is at a 30-m spatial resolution and covers the CONUS area of the United States. The merged file retains spatial and classification details of vegetative fuelbed characteristics provided by the FCCS file, while being enhanced by the crop and grassland details provided in the CDL layer. The logic of the merging process is provided in Section 5 and a table of numeric code value descriptions and CDL-to-FCCS matching is provided in the comma-separated companion file CDL-FCCS_Crosswalk.csv. This data set provides a 30-m comprehensive fuelbed map for both the wildland and cropland areas of the conterminous United States. 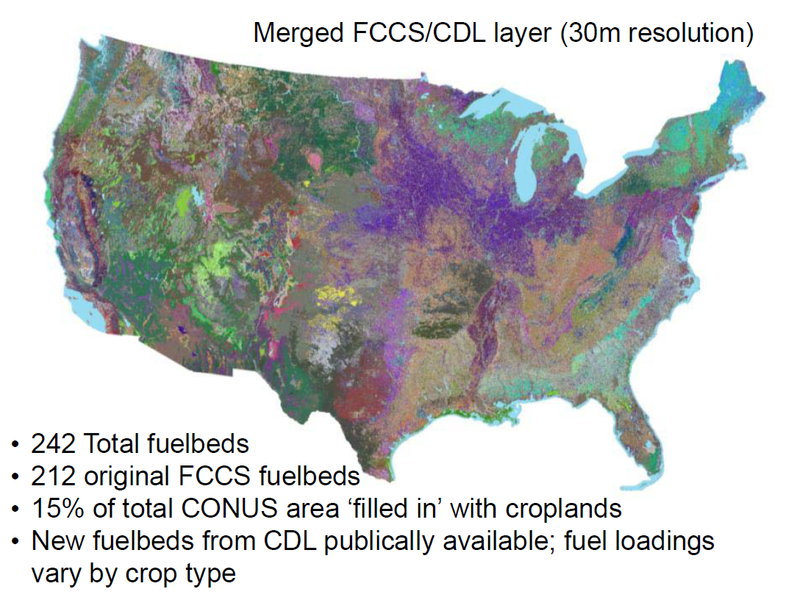 By combining the spatially discrete details of the FCCS data set with the crop-and grassland-specific information of the CDL, a more robust map of fuelbed characteristics is available. The merged product has an advantage over the original FCCS map for estimating emissions from burned areas due to the integration of the fuelbed characteristics for agricultural areas from the CDL. Figure 1. A mosaic image of the merged FCCS/CDL layer for the CONUS with characteristics as noted (French et al., 2012). Figure 2. Common subsets of (a) FCCS 30m product, (b) CDL2010 30m product, and (c) merged product. Images demonstrate the filling in of gaps with the Cropland Data Layer (French et al., 2012). The data used in this product are derived from the USFS's FCCS map, which is based off of the USGS Landfire program (http://landfire.gov), and from the USDA Cropland Data Layer (http://nassgeodata.gmu.edu/CropScape) product. Processing of these base data into the final product was performed at MTRI under grant funds from the NASA Earth System Science Carbon Cycle Science Program Grant #NNX08AK69G. The files provided by the Integrated Wildland and Cropland Fuel Characteristics dataset provide a high-resolution (30-m) comprehensive fuelbed map for both the wildland and cropland areas of the CONUS. By combining the spatially discrete details of the Fuel Characteristic Classification System (FCCS) data set with the crop-and grassland-specific information of the Cropland Data Layer (CDL), a more robust map of fuelbed characteristics is available. This data set provides the following three GeoTIFF format files. The three tif files provided are very large and exceed the size limits of a standard GeoTIFF file format (4 GB). File sizes range from 20 to 30 GB. Compressed file sizes range from 2 to 3 GB. They are in a format that is called a BigTiff file. ArcGIS 10.0 and ERDAS Imagine are able to read these files. The BigTIFF format files have been tarred and zipped for distribution (*.tar.gz). Even so, the compressed file sizes range from 2 to 3 GB. When extrapolated, the *.tar.gz files contain the *.tif format file and three auxiliary files: *.tif.aux.xml, *.tif.ovr, and *.tif.vat.dbf. •	A 30-m continuous discrete raster file of the Cropland Data Layer for year 2010 mosaicked from individual state layers. •	A 30-m continuous discrete raster file of vegetative classes of the FCCS covering the conterminous United States. •	Describes the vegetative code classes for the CDL layer as well as how the vegetation codes for the CDL layer were crosswalked to FCCS codes. To view the data in most GIS and image processing software packages, statistics need to be calculated for each raster file. For example, using ESRI's ArcCatalog, right click the GeoTIFF raster image and choose 'build statistics'. The merged product has the advantage over the original Fuel Characteristic Classification System (FCCS) map for estimating emissions from burned areas due to the integration of the fuelbed characteristics for agricultural areas from the Cropland Data Layer (CDL). No quality assessment on this merged product has been performed. The QA for base data sets can be reviewed at the web sites of the originating data sets. The Cropland Data Layer (CDL) provided is unique in that we mosaicked the state CDL layers together to form a continuous CONUS CDL layer. The FCCS layer is unique because it is a 30-m resolution and the one provided to the public is a 1-km resolution. A fuelbed reference list is available from the FCCS website: http://www.fs.fed.us/pnw/fera/fccs/fuelbed_references/fuelbed_references_2-14-2007.pdf. - CDL2010 30-m product (see Source 1 below) was mosaicked to cover CONUS. - CDL mosaic was reclassified given the attached crosswalk (CDL-FCCS_Crosswalk.csv) using ERDAS Imagine Model Maker. - New FCCS fuelbeds (1200s) were created to account for agricultural burning. - General non-cropland pixels within the CDL classes (e.g., "Deciduous Forest", “Evergreen Forest”) were reclassified to 0 so that existing FCCS fuelbeds would take priority in these areas. - FCCS 30-m product (see Source 2 below) and CDL (reclassified) were layer-stacked using ERDAS Imagine. This last step was added because there were some areas that were classified as "Grassland Herbaceous" in the original CDL that we wanted to fill in with a specific grassland type from the FCCS, but in some of the areas that were classified as "Grassland Herbaceous" they were also classified as agriculture in the FCCS. To account for this, in situations where a pixel was "Grassland Herbaceous" in the original CDL, but was NOT filled in by the FCCS and thus remained 0 in the merged layer, we assigned these pixels the value of 1262, which corresponds to the new fuelbed called "Pasture/Grass." "Pasture/Grass" is a fuelbed based on the CDL classification by the same name. * - In this FCCS layer, values above 980 signified agriculture and cropland. There was no 0 value, but rather a NoData value that was used only in areas outside of CONUS. where r is the residue-to-crop ratio, d is the dry matter fraction, and C is the crop production. r, d, and C can be found for each crop type in a variety of sources (see Sources 3 - 9 below). Note: The Sources listed in Section 5 are the references for this data set. French, Nancy H.F., Don McKenzie, and Tyler Erickson. 2012. Wildland Fire Emissions Information System for retrospective fire emissions mapping for North America. Presented at the 2012 ACCENT-IGAC-GEIA Conference, 11-13 June, Toulouse, France.